Because of the complexity of our product line, and the difficulty associated with shipping large bulky items, our shopping cart will not allow you to automatically purchase without talking to our sales group. Using the cart, you can choose all of the items you would like to purchase, and automatically submit that list to us. We do not ask for any kind of payment or commitment. For a list of our products visit our website. 1 – That you have selected the right product and accessories for your application. 2 – If you need a special shipping service (tailgate lift). 3 – Is it a residential or business delivery (large trucks have difficulty on small streets). 4 – Do you need assistance in the assembly (we may have local specialists that can help you). 5 – Do you qualify for any product discounts or shipping subsidies. When we have covered these points and reviewed any other concerns you may have, we will ask for payment. Bulk sales – We have a discount structure in place for that. Please give us a call to discuss your needs. Also, we will work with your local dealer to provide the highest level of service at the lowest possible price. 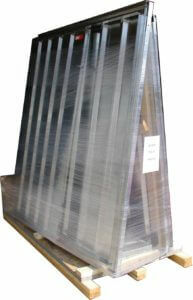 Some items can be shipped more than one on a skid, this keeps the shipping costs lower, ask us for the details. Call us at 1-888-335-4507 (204-475-4966) or click here to use our contact form for more information about bulk sales.